Xbox has announced two deals for its Xbox One S and Xbox One X game consoles, which will be available at most major retailers for a limited time. 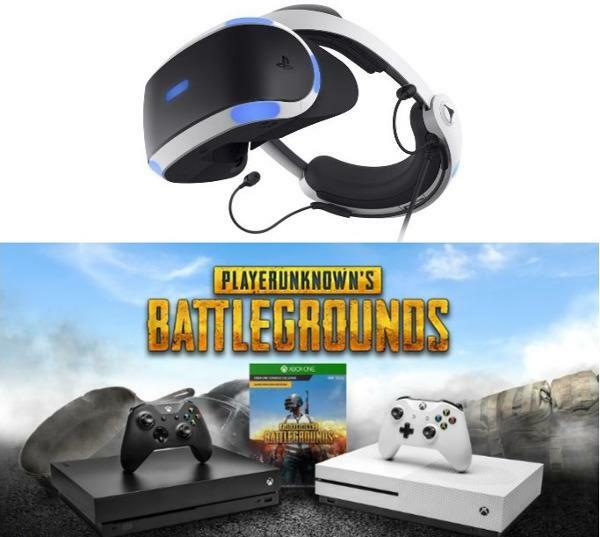 Deal one: Xbox One X consoles purchased between February 18 and February 24 will include a digital copy of one of the hottest game on the planet — PlayerUnknown’s Battlegrounds, which has amassed more than 4 million players across the Xbox One family of devices. Deal two: Between February 18 and March 3, Microsoft is offering a $50 discount on Xbox One S bundles, including the new Xbox One S PlayerUnknown’s Battlegrounds Bundle launching on February 20. Sony also announced that it will reduce the price of its PlayStation VR by $100 on purchases made between February 18 and March 3. The company is also discounting several bundles, including the Gran Turismo Sport bundle, which includes a headset, a camera, and the racing game for $200. Price cuts will also be available on the Doom VFR and Skyrim VR bundles, bringing them down to $300 and $350, respectively. yeah but you should be okay because by the end of this year, possibly around black friday or during christmas holiday, the psvr price might drop some more. As low as $150 is my guess though. by then, if you have the money, and if you are into vr, you can afford it. There still aren't any games that I feel I have to have for VR right now. I mean, Doom looks cool but I don't know if I can justify spending another 60 bucks for a game I already own, beat and enjoyed. When they start releasing more mainstream games in VR, I'll likely make the investment.